Yakima's been doing roof racks for a long time, so it's big news when they come out with an all-new, aerodynamic, integrated roof rack system! Dubbed 'StreamLine', Yakima's new product line started hitting our warehouse in early March, and inventory is still being added. The StreamLine system fits a wide range of vehicles and roof styles, plus it looks great. With this new system, Yakima is reducing the number of different fit parts, so it's easier to figure out which one's right for your car! TimberLine. The Yakima TimberLine tower is for raised factory siderails, and is replacing the RailGrab tower. They come with a super strong, over-molded stainless steel strap, so installing and securing them are a breeze. RidgeLine. The Yakima RidgeLine tower is for flush factory siderails, and is a replacement for RailGrabs. The RidgeLine towers require the correct Yakima RidgeClips to connect to your specific vehicle. The RidgeLine system is rock solid, and is also designed with 12 degrees of pitch adjustment to help you get the best tower position and level crossbars. SkyLine. The Yakima SkyLine tower is for factory fixed mounting points, tracks, and custom permanent installations. This tower is replacing the Control Tower, and as anyone who's used them knows, these are dead-simple to install and use. Make sure you purchase the correct Yakima Landing Pads to mount the SkyLine towers to your vehicle. BaseLine. The Yakima BaseLine tower is for naked/bare roof vehicles, and is replacing the iconic Q tower. The BaseLine tower has a new DropHook clip adjustment to help make sure you get an accurate installation fit on your vehicle - these towers use the new Yakima BaseClips to attach to vehicles. Designed with 12 degrees of pitch adjustment to help you get the best tower position and level bars on rounded roofs. CoreBar is the first aerodynamic steel crossbar. It provides high weight capacity, affordable pricing, and aerodynamic teardrop design for minimum wind noise and maximum fuel efficiency. 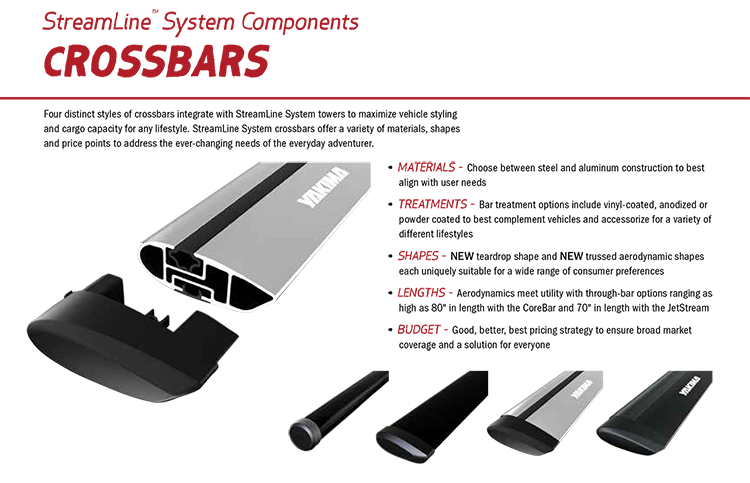 Yakima's new CoreBar comes in crossbar lengths up to 80" - longer than any other aerodynamic crossbar. All of Yakima's crossbars are compatible with every roof tower in the StreamLine system. Their original round crossbar is still available, and needs an adapter to work with these new towers. And keep an eye on other new products coming out this spring from Yakima. These include several new bike racks - FullBack, HalfBack, SpareRide, and LiteRider. Yakima's also updating some of their existing hitch bike racks, so whether you're looking for a deal on an older model or want the latest-and-greatest, we've got it! The other big product news is Yakima cargo boxes. They have released a new premium cargo box, the ShowCase. Yakima ShowCase is available in Quicksilver and Anthracite (that's silver and black for the rest of us). The new cargo boxes come in 15 and 20 cubic feet sizes. They provide aerodynamic design, modern styling and robust features to create the ultimate cargo box. The new ShowCase line is replacing the SkyBox Pro models. Yakima SkyBox Carbonite is the current main cargo box line from Yakima.